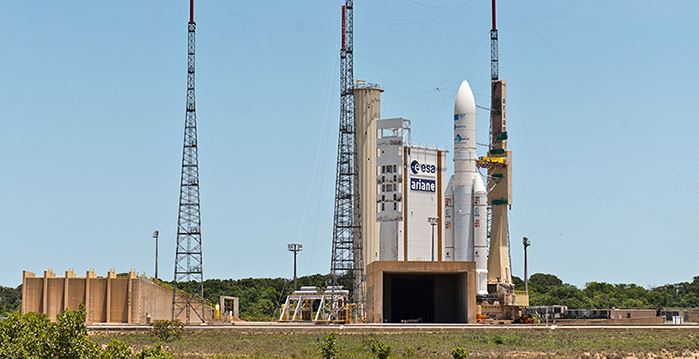 Europe’s Ariane 5 workhorse is ready for its next mission, standing tall atop its launch pad at the Guiana Space Center, topped with two communications satellites to be operated by Australia and Argentina. Liftoff of the VA226 mission is set for Wednesday at 20:30 UTC, the opening of a 105-minute launch window. 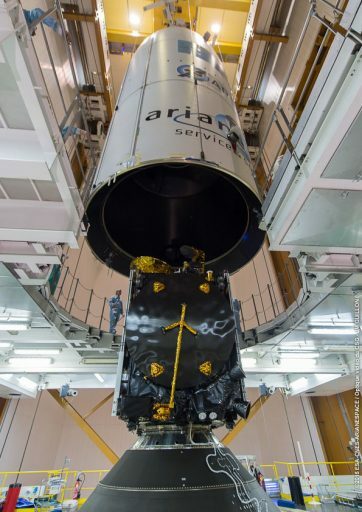 Hidden under the huge payload fairing of the Ariane 5 launcher is a stack of two satellites, ARSAT-2 riding in the lower slot, covered by the Sylda structure that supports the larger upper passenger that for this flight is the NBN-Co 1A satellite also called Sky Muster. Sky Muster is an extremely powerful communications satellite built by Space Systems/Loral for operation by NBN Co. Ltd. to deliver broadband services to rural and remote locations across the Australian continent. Weighing in at over 6,700 Kilograms, Sky Muster bolsters a whopping 202 Ka-Band transponders to generate a vast array of communication beams to deliver high-speed broadband to remote areas in the outback, Australia’s coastal islands and external areas as far as Antarctica. 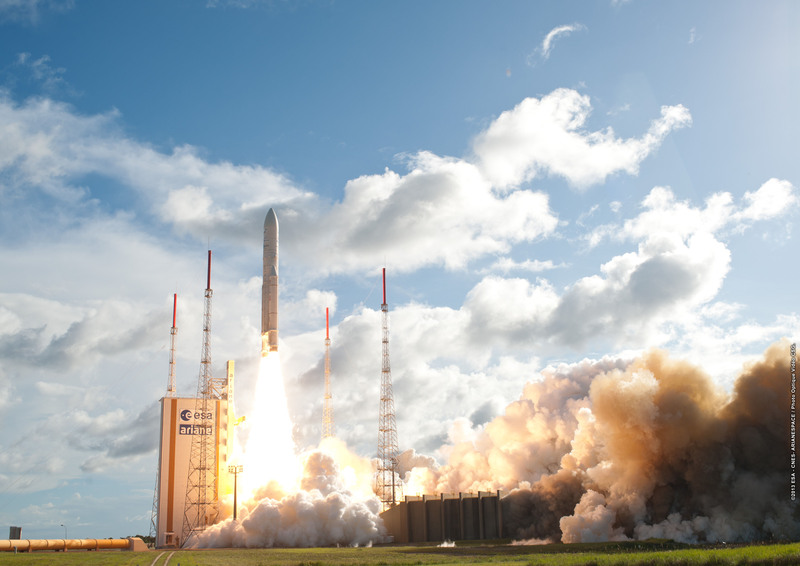 Sky Muster will be joined by a second satellite to cover the entire Australian territory. 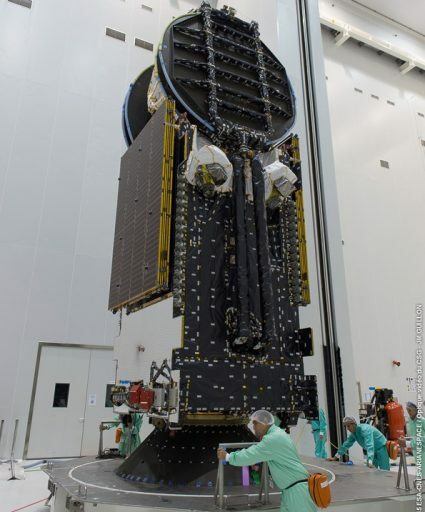 ARSAT-2 is the second communications satellite built by Argentina following in the footsteps of ARSAT-1 that launched in October 2014 and became the first large satellite project headed by Argentinean company INVAP. 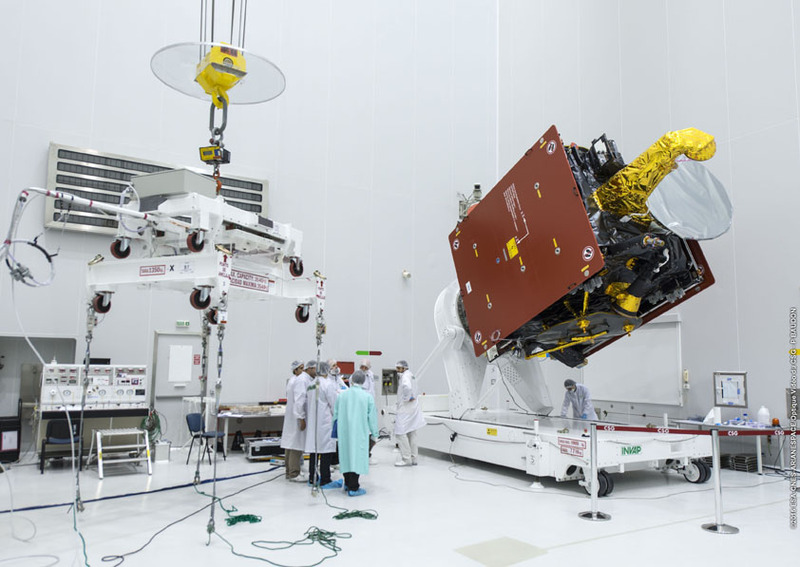 As a three-metric-ton satellite, ARSAT-2 hosts 10 C-Band and 26 Ku-Band transponders to cover the Americas, delivering different data services as well as television distribution. Gaining experiences in the space sector, Argentina aims to reduce its reliance on foreign contractors – introducing more and more home-built components on each subsequent satellite mission. 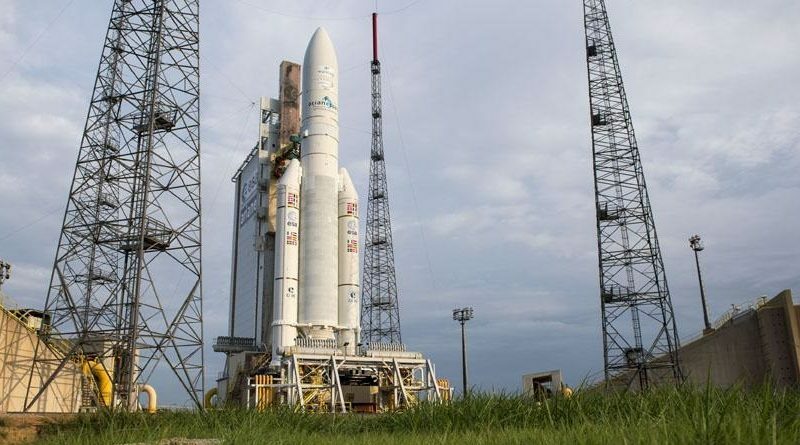 Preparations for this launch began at the Guiana Space Center in the second half of July when the components of the Ariane 5 launch vehicle arrived by one of two sea-going vessels that are used to ship rocket parts from their manufacturers in Europe to French Guiana. 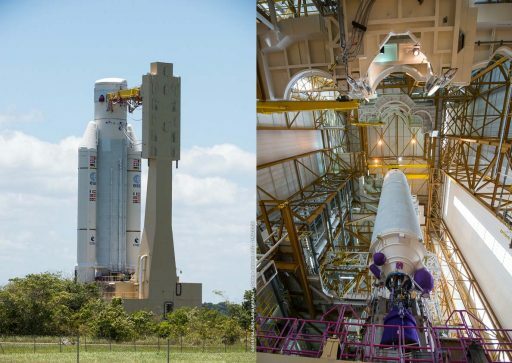 Assembly of the Ariane 5 was completed in the first two weeks of August as the large 30.5-meter core stage was installed atop the Launch Table followed by the attachment of the twin Solid Rocket Boosters, each holding 237 metric tons of propellant. Finally, the cryogenic second stage already integrated with the brains of the Ariane 5, the Vehicle Equipment Bay, was installed atop the stack. The two satellite payloads arrived at the launch site in the second half of August to undergo final processing which consisted of fit checks with the payload adapters, a last set of checks and inspections and the loading of propellants for use during the satellites’ lengthy missions. When the Ariane 5 had moved into the Final Assembly Building, the integration of the payloads atop the rocket began – installing the smaller passenger directly atop the Vehicle Equipment Bay and attaching the larger payload to the Sylda Adapter and then enclosing the stack in the large fairing followed by the lowering of the stack over the first passenger. ARSAT-2 took the lower slot while Sky Muster rides into orbit atop the Sylda. Mission Simulation Tests were underway on Thursday and Friday and teams headed into ordnance installation and arming of the launcher over the weekend. Final arming was completed on Monday and the Launch Readiness Review was held by Arianespace and payload managers to clear the way for the rollout of the rocket on Tuesday to mark the start of final launch preparations. Ariane 5, sitting atop its launch table, slowly emerged from the Final Assembly Building for its trip over to the ELA-3 launch pad to begin final preparations for liftoff as part of a streamlined process that was optimized over the years to fit the final launch campaign of Ariane 5 into a single work week. Taking about one hour, the launcher made its slow trip to the ELA-3 launch pad where the launch table was precisely aligned to allow teams to install propellant umbilicals, mate data and electrical connections and complete a final set of testing before beginning to close out the pad & launch vehicle. Returning on Wednesday, teams will complete final hands-on work at the launch pad as the 11.5-hour countdown gets underway with tanking preparations and testing of the Ariane 5 rocket. A detailed Ariane 5 countdown timeline is available here. Liftoff of the 777-metric ton, 53-meter tall rocket is expected at 20:30 UTC under the power of the Vulcain 2 main engine of the Core Stage and the two Solid Rocket Boosters that will be doing most of the work as Ariane 5 aligns itself with its due easterly flight path. The twin boosters will burn for two minutes and 22 seconds before separating from the Ariane 5 launch vehicle. Powered by the Vulcain 2 engine alone, the vehicle will depart the dense atmosphere for the separation of the Payload Fairing three minutes and 20 seconds into the flight. The first stage will shut down eight minutes and 51 seconds into the mission with the separation of the stage six seconds later and the ignition of the HM-7B engine of the second stage on a burn of 16 minutes and 5 seconds. The mission is targeting an orbit of 250 by 35,786 Kilometers at an inclination of 6.0 degrees. Separation of the Sky Muster satellite is planned 27 minutes and 59 seconds after launch, followed by the jettisoning of the Sylda payload adapter and the release of the ARSAT-2 satellite 32 minutes and 28 seconds into the flight. The Ariane 5 mission concludes at T+49 minutes after passivation of the upper stage.